Bar charts graphically summarize and display categories of data and let the user easily compare amounts or values between different categories. Bar charts are useful for comparing multiple series of data (i.e. providing snapshots of data at particular points in time). In the examples below the categories are various sources for sales (Internet, Wholesale, Retail) that combine to make the total sales for each quarter. RadChart automatically displays each series in a different color to make them easier to distinguish. 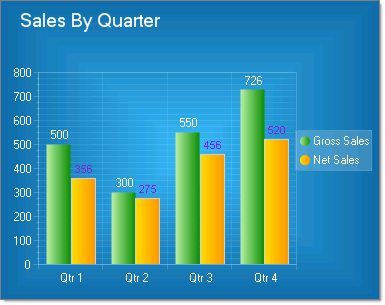 To create a Vertical Bar Chart set the SeriesOrientation property to Vertical. Set the RadChart DefaultType property or ChartSeries.Type to Bar. 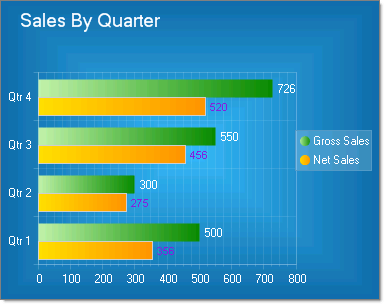 To create a Horizontal Bar Chart set the SeriesOrientation property to Horizontal. Set the RadChart DefaultType property or ChartSeries.Type to Bar.